This is what I've been doing instead of writing my chem lab report. Lol. Browse Chrno Crusade Gallery: Recent | Popular. Man this is great wallpaper. Just love the details you put in and how it looks. Only - the image dont really fit with the setting - well they kinda do, but not ... really. Hmm how to explain it, its just the quality of the image. Wicked setting and nicely done! It shows how much time you have put in. The glasses of milk look so cute!! I want a drink! !The cookies look like brownies though =D Your curtains look awesome! They don't look bad at all. They look like they have a design on them and you did great with the shadows to give the illusion of folds. Cool posters, ha ha milk... & the snow is good too! Sorry!! But they do to me! Cool wall, keep it up!! wow!! you did all that by yourself?? that is awesome!! 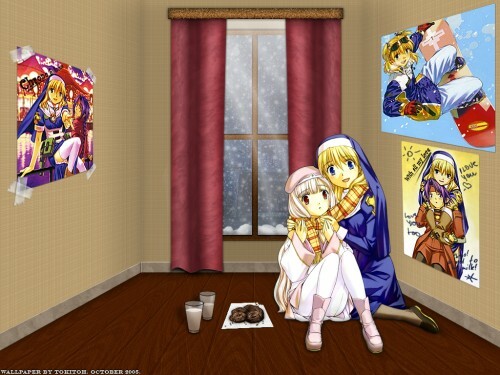 i like the snow, cookies and milk^^ they're cute^^ the room you drew is nice too, but i think it needs some shadows or shadings. Hmm, background is impressive, but some of the things need better textures I guess, the characters are cute and go right in the corner, right where they look the cutest, awww..cuddling together..=) +fav! The writing on the wall is absolutely adorable stuff, nice touch.